You get to pick 4 of these fabulous hair clips! For girls of any age! These hair clips are great for everyday wear, to hold back bangs, or to add a little "bling" to any hair style! Perfect set for little ones that don't like big bows, but still need a little something in their hair. Also great for adults that want that extra sparkle! Pick all of the same color, 2 Pairs, or any combination of 4 clips! IF NO COLOR CHOICES ARE LISTED YOU WILL RECEIVE SELLERS CHOICE OF 4 COLORS. 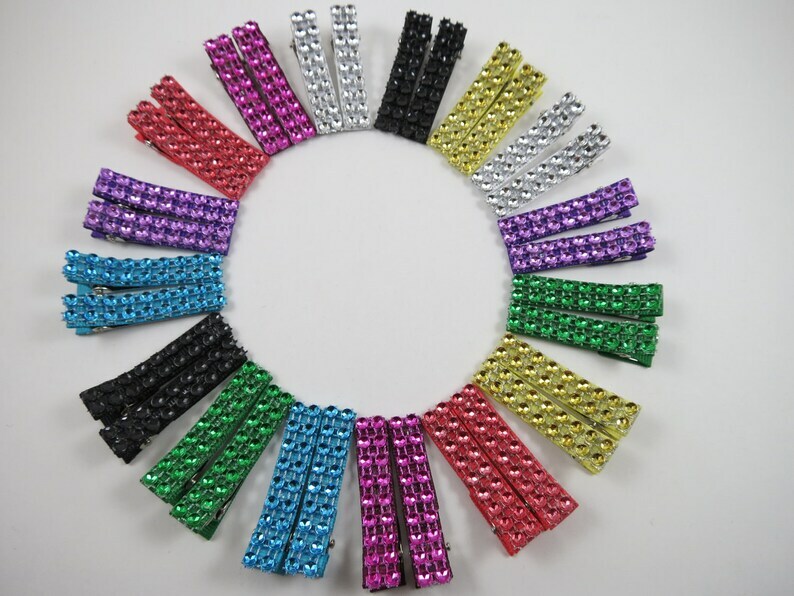 All hair clips have a DIAMOND MESH attached to a partially lined alligator clip in a matching ribbon color. All ribbon clips are lined with grosgrain ribbon. All ribbon ends have been heat sealed to prevent fraying. Clips measures 1 3/4" X 1/4" each. Looking for a different color? Do you need a bigger set? Message me and I can list a custom item for you!